Thai coconut soup is an easy and flavorful vegetarian and vegan soup to try, made with Asian ingredients and a coconut milk base which is much different than the usual broth-based vegetable soups which are more common. The flavor comes from the deliciously spicy and fragrant combination of the Thai ingredients: red chili peppers, ginger, lemongrass, and lime. This Thai coconut soup recipe is both vegetarian and vegan. All of the ingredients are gluten-free, except for the vegetable broth, which may or may not be gluten-free. If you're buying vegetable broth, check the ingredients list, as many have additives which contain hidden gluten. Or, make your homemade vegetable broth, so you can be certain what's in it. First, in a large soup or stockpot, sautee the onion, garlic, sliced carrots and shiitake mushrooms in oil for just a few minutes until lightly cooked; do not overcook. Reduce heat to low and add the vegetable broth, coconut milk, sliced ginger, lemongrass, tofu and juice from one lime. Simmer over low heat for at least 15 minutes. Stir in the fresh chopped cilantro just before serving. 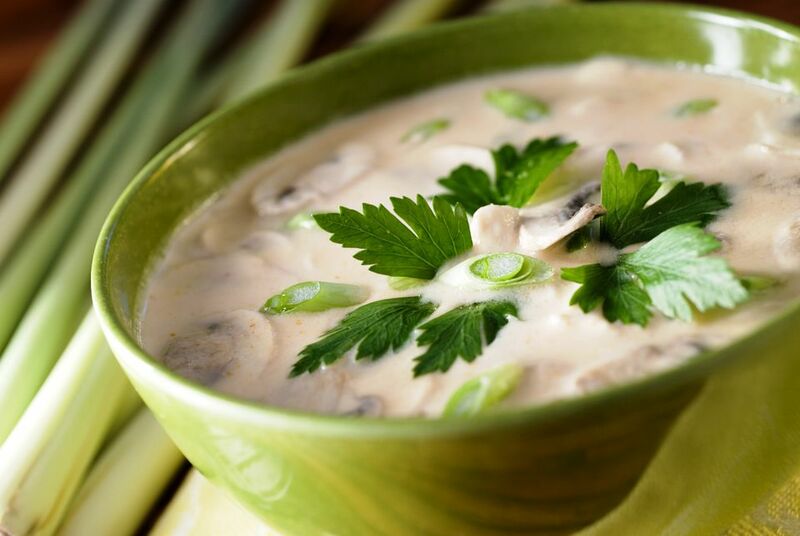 Enjoy your vegetarian Thai coconut soup! To make this coconut soup a full meal, just add extra tofu and vegetables (try steamed broccoli, snap peas, cauliflower or bell pepper) and serve it alongside some steamed white or brown rice, or maybe even some quinoa, if you prefer. Although this recipe calls for shiitake mushrooms and carrots, just about any vegetable will do. How Do You Make Gluten-Free Vegan Carrot Soup With Coconut?